How do you and your kids start your day? Breakfast, sure, but what kind? This is one of many recipes that is a jumping off point for whatever moves you, a choose-your-own adventure breakfast. We love these kinds of customizable recipes in my family – everyone gets their own personalized version of a dish, sometimes being inspired by someone else’s choices (“wait, I want salsa on mine, too!”), sometimes being a little intentionally wacky (“what’s wrong with hummus in a quesadilla?”). Start with scrambled eggs when thinking about the filling - then the sky is the limit in terms of what you might add – a bit of cheese (more protein! ), all kinds of vegetables, maybe herbs or spices, perhaps some bacon or sausage (try some of the leaner turkey or chicken varieties). Leftovers in the fridge? Oh my yes, add those right in – some sautéed spinach or other greens, some cooked beans, or roasted squash or shredded pulled pork. 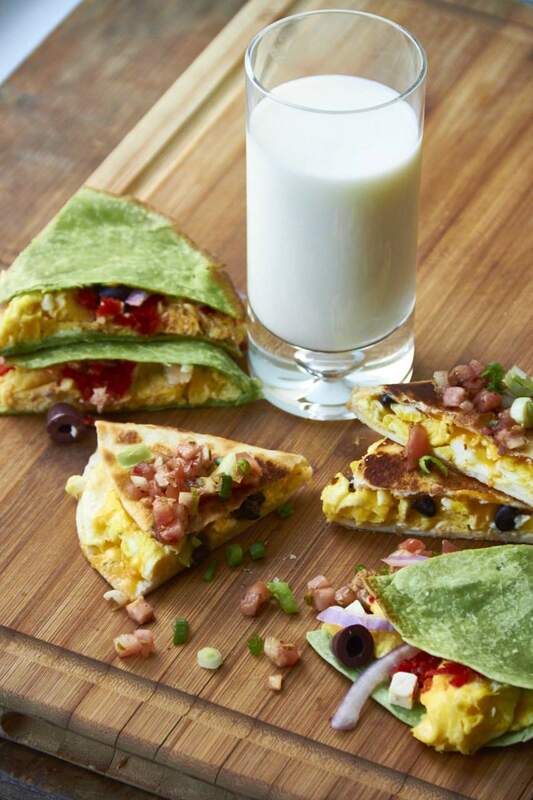 Everything can find its way into a breakfast quesadilla. And these are easy enough to pull together on a weekday, and festive enough for a weekend. And speaking of protein, getting those grams in the morning is important for both kids and adults. Getting enough protein can help you all feel fuller longer, which helps you concentrate better at school and at work –those are some pretty important reasons. One of the easiest and kid-friendliest ways to bump up the protein of whatever breakfast you decide on is to add a glass of wholesome milk, one 8 ounce glass has 8 grams of high-quality protein, and 9 essential nutrients. And there are so many kinds of tortillas available today (tomato, spinach, whole grain) - a great way to provide additional variety in this recipe, not to mention fun splashes of color. These are of course great shared at the breakfast table, but you can also wrap these while still warm in aluminum foil or parchment paper and eat them on the run. (But gulp down that milk first!). Click here for more recipes. In a medium bowl, beat the eggs with salt and pepper. Melt 2 teaspoons of the butter in a medium skillet over medium-high heat. Pour in the eggs, and scramble them, stirring occasionally but letting the bottom set a bit in between stirs. Stop just barely before they are done to your liking, as they will continue to cook in the quesadilla, and scoop them into a plate. Wipe out the skillet, and then heat it over medium high heat. Melt 1 teaspoon of the butter in the skillet, then place one of the flour tortillas in the skillet. Place 1/4 of the scrambled eggs one half of the tortilla, and sprinkle 2 tablespoons of shredded or crumbled cheese over the eggs. You can either call it a day and fold the bare half of the tortilla over the filling, or sprinkle over any of these suggested toppings: diced avocados, guacamole, diced tomatoes, salsa, sliced olives, bacon, sausage, black beans, minced onions, minced bell peppers, spinach, scallions, etc. Use a spatula to fold the bare half of the tortilla over the filling, and let cook for 1 to 2 minutes, until the bottom of the quesadilla is golden brown. Use the spatula to flip the quesadilla over and cook for another 1 to 2 minutes, until the other side is golden brown. Slide from the pan onto a plate, cut into thirds. Repeat with the remaining, butter, tortillas, eggs and desired fillings, and serve each one hot with a glass of cold milk. This article is part of a collaboration with the National Milk Life Campaign, and I am pleased to share this recipe with you!